The Mac OS and most applications do a good job of recognizing URLs so you can click on them to go to their location, either directly or with the contextual menu (usually via the right mouse button). Either click on it if the computer knows it is a URL, or right-click (or control-click with the main mouse button) on it and choose “Open URL” from the contextual menu. But this does not always happen. Not every application recognizes a URL, even with a “www” in front of it. There are a lot of programs and possible scenarios, and the end result is sometimes you have a URL right there in front of you but the computer doesn’t understand that the text is a URL. You could copy the URL, switch to your browser, open a new window, paste the URL into the address field, and tell the browser to open it. That’s a lot of steps. I know, I used to do it. But there is a better idea. 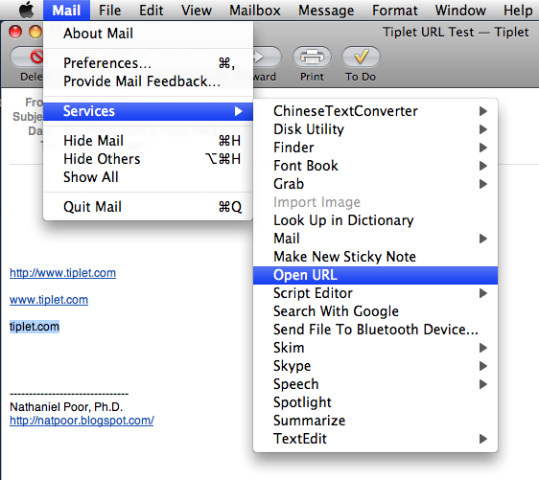 A somewhat forgotten, under-developed part of OSX that is a holdover from OSX’s NEXSTEP roots: the Services menu. The Services menu is actually a submenu, found in the application menu. 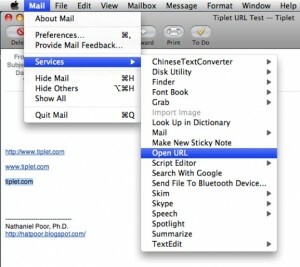 (The application menu is the one with the name of your currently active application, so Mail, or Safari, or Finder, etc.) Open the Services menu, and you will see a lot of further submenus and menu options, some of which may be grayed out (it depends on what you are doing and what text or other items you might have selected in the application). If you have some text selected, you can choose “Open URL” from the list. Make sure it’s a valid URL, “tiplet” by itself won’t work, but “tiplet.com” will. The idea behind the Services menu holds promise, and with OSX 10.4 there was a third-party application, “Service Scrubber,” that allowed you to clean out the Services menu to your liking. With OSX 10.5 though, Apple changed a few things under the hood and the Services menu is back to being a long list of things you’ll never use and never knew existed. Except for “Open URL,” I hope. Nathaniel Poor holds a Ph.D. in communication studies from the University of Michigan, where he studied media, technology and society. He has owned at least one Macintosh at any given time since 1988. He has built a PC, run Linux, and is a proponent of open source ideology. He is always on call for tech support for his mom. Currently he is a freelance researcher in New York City.